Ohio State technically plays Maryland this week but everyone is already focused on The Game against Michigan two Saturdays from now. Once again, this year’s contest carries Big Ten Championship and College Football Playoff implications with the rivalry game acting as a de facto elimination game for the title picture. Tradition abounds when it comes to The Game, but Ohio State University officials are actively trying their best to put an end to one of them, and with good reason. For years, Ohio State students have commemorated the week of The Game by jumping into the school’s famed Mirror Lake on campus. Tragically, student Austin Singletary died in 2015 as part of the annual tradition when he broke his neck jumping into the shallow body of water. The jump was banned immediately thereafter. The area of the lake has been under construction recently. With the area re-opened, the university has ensured that the tradition can’t be re-instituted in any form or fashion. This weekend OSU’s department of public safety announced that the lake would be drained in the lead-up to the Michigan game, preventing any sort of lake jump. The newly reconstructed lake has the ability to be drained by the university in under an hour. 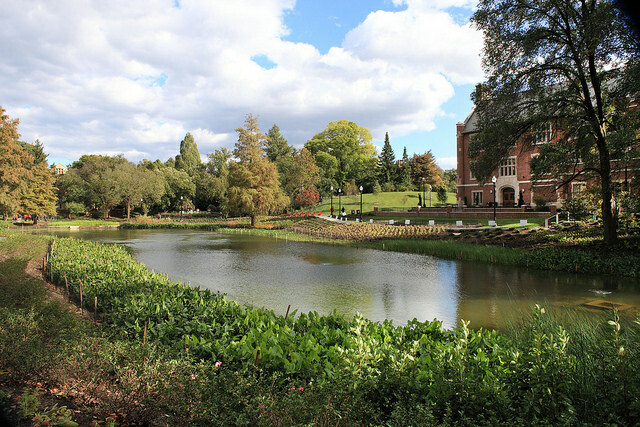 Mirror Lake had been under a major renovation that started in late 2016, and the district reopened with Pomerene Hall before autumn semester 2018. USG Vice President Shawn Semmler said the focus has always been on student safety, and he and USG President Shamina Merchant felt the decision to drain the lake is the best way to prevent students from attempting the jump. Semmler added that he felt there was rhetoric in the student body that suggested the jump would return in 2018 since the lake was back after an extended absence, but said there should be other ways to celebrate the week of Ohio State’s rivalry game against Michigan. College football is all about tradition, but as much as some students may be disappointed by this, it’s clearly the right decision for everyone’s best interests. Hopefully, the OSU community will find something new to bring the university’s students together to celebrate Michigan week moving forward.